Portable solar power systems maker Goal Zero unveiled at CES on Wednesday a compact and lightweight system that uses solar energy to charge mobile devices. The new Guide 10 Adventure Kit is built to charge completely in four hours of full sunlight to deliver portable power to a variety of USB and DC devices. When fully charged, it should deliver 30 hours of power for a cell phone, seven to 10 hours for a smartphone or 40 hours for an iPod, for example. Underlying the Guide 10 Adventure Kit is Goal Zero's new Guide 10 power pack, which consists of four AA rechargeable batteries, a USB output port, and an LED flashlight. The power pack is designed to work in conjunction with the 7-watt monocrystalline solar panels of Goal Zero's foldable Nomad 7M--which is included in the Adventure Kit--but it can be charged from a laptop via USB connection as well. "As the market for portable handheld devices such as smartphones, tablets and cameras continues to explode, consumers are developing an ever-growing reliance on these devices and want to stay connected, no matter where they are," said Joe Atkin, CEO of Goal Zero, in a press release. The Guide 10 power pack can be purchased alone for $39.99, or as part of the Guide 10 Adventure Kit for $139.95. It will be available in March through major retailers such as REI, Eastern Mountain Sports, Bass Pro, and Cabela's. 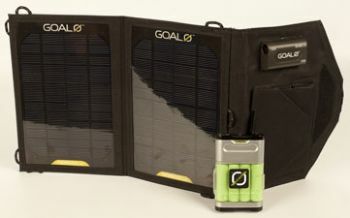 Compared with Goal Zero's other products, the Guide 10 Adventure Kit is made up of both a smaller solar panel and power supply, so it delivers fewer watt-hours of power than the company's bigger systems. Goal Zero's Sherpa 50 Adventure Kit, for example, is meant to power a smartphone for 50 or more hours. For mobile users, however, the new product's convenience, size and cost can be real advantages. Whereas the next-lightest Sherpa 50 Adventure Kit weighs 3.7 pounds, for example, the Guide 10 Adventure Kit weighs 0.9 pounds. The folding Nomad 7M solar panel, meanwhile, measures just 6 by 9 by 1 inch. At $139.95, the Guide 10 Adventure Kit costs less than half of Ground Zero's next most affordable full kit, which is $359.95. If it works as specified, this sounds like a great solution for small to medium-sized businesses and mobile workers who rely on portable devices while on the road. The icing on the cake? Recognizing its products' suitability for use in developing countries, Goal Zero donates a portion of all proceeds to Tifie, a humanitarian effort to establish sustainable businesses around the world.